Rule 1 – What goes around, comes around. Rule 2 – It doesn’t matter what anyone else does with the Gospel, it only matters what I do. Rule 3 – The level of concern for my problem is inversely proportional to the square of the distance of the person who needs to solve my problem. Rule 4 – Life’s not fair, get over it. Rule 5 – Life is short and then you die. Rule 6 – In all things, leave people better than you find them. Based on the work of Nassim Nicholas Taleb this ebook is an ongoing compilation of experiences from a wide variety of contributors in many walks of life. 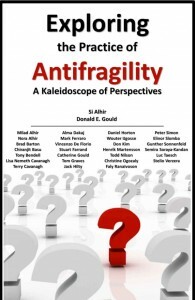 Si Alhir teams up with Donald E Gould to edit, champion and further the concept of espoused in “Antifragile: Things that Gain from Disorder” by Nassim Taleb. 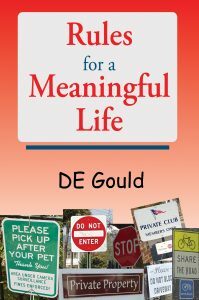 You can find the book on Amazon here. Lisa dropped to her knees in agony. One minute she was pensively gazing through the living room window, the next she was on knees. She screamed . Her hands pressed tightly against the sides of her head as she desperately tried to contain the pain. Wave after wave coursed through her, interspersed with thoughts of Tim. Sudden realization burst in Lisa’s mind, she was feeling his pain. Waves of anguish seasoned with helplessness crashed over her Seconds stretched into hours, minutes into days. The pain ceased instantly. She reeled from the cessation, her mind in a state of confusion at the sudden and profound change. She barely registered the back door slamming shut and Susan running into the room. “Tim, he’s … he’s in trouble,” she cried, trying to catch her breath. “In trouble? What do you mean? Did he call?” Susan asked. “I’m going with you,” Susan said. The breeze wafting through the back wall was warm and tainted with salt. They looked out across the Banana River, gazing through nothing at the distant view. Susan stuck her hand through the window frame surprised when her fingers passed through the space where glass should have been. Ana’s cousin was dead. It was certain, Ana would be next. Even if Prakesh didn’t kill her, she would die. To touch the one you love is life; never seeing him again, never thrilling to his touch, had to be death. The killer knew how to cover his tracks: don’t stand out, be invisible and leave no trace. It would be days before anyone discovered the car, or Jaiya’s body. Ana didn’t know where she would be by then. The black SUVs inched slowly back to the highway and turn south. The drugs had acted quickly. Ana’s eyes closed and her mind went blank. The motel parking lot was nearly empty as the SUV turned off the highway. It was mid afternoon. Ana thought it was the next day, but wasn’t sure. The fog in her head made thinking difficult. Prakesh smiled as he slowly closed the gap. Falling in love is only a dream for most women from India. For Ana, it was a dream that became real the day she met Tony. She didn’t regret loving him. She regretted never seeing him again. Zaran, the apostate, smiled too. It had taken him a thousand earth years to figure out how to influence a human. It was a secret he was not supposed to know. It was the secret he used to get Prakesh to kill. The so called plan The First Companion had conceived was wrong he had argued. Why should we have to go through this Earth nonsense? It was unnecessary and unfair. The others had to be shown, if they wouldn’t do it his way. If they wouldn’t bend to his will then he they would be destroyed. Jserel, watched. ‘Somehow the plan was off track,’ he thought. Jaiya was not supposed to die. Zaran was livid. His followers cowering in fear. “Ten thousand years wasted,” he screamed. “We finally find a susceptible human and he gets himself killed. Where is he now?” he demanded. Zaran’s anger settled to a slow burn. ‘None of these charades would be needed if The Others would just listen to me. All the games and planning, it’s a waste of time,’ he thought. He had to find a way to show everyone The First was wrong. “What did we do so this Prakesh could hear me?” he demanded. “Interesting, there must not be many like that or we would have found them before,” Zaran noted. “Can we find more mortals of that type?” Zaran asked. “Now that we know what kind of mortal to look for, yes we can find them.” they assured him. Angela had to die. There was no other way. Decades of torment came down to this one decision. The early morning night was dark, hot and muggy making the oppressive choice more terrible. He waited in the family van to take this final step when pain as real as fire, as jagged shards of glass on skin scorched his very soul. A vision of two paths real and filled with loss burst into his mind. The vision flowed quickly where, finally, at the end, a decision lay. The other woman, left lying in the bed they’d shared for fifteen years, waited. Her mind filled with fleeting thoughts and plans; if he doesn’t come back I’ll tell people he died, he’ll never see my girls again, how can I tell my parents, how will I get back to South Carolina, what will become of me? If he does come back, what will I do; can I help him, can I forgive him, how will I cope with him, so different, what will become of us? The soft sound of a car door closing shattered her stillness; the time of reckoning had come. Slowly he made his way to the bedroom where she lay and eased the door open. The woman waited with tears brimming filling anew the long dried tracks on her cheeks. His grim face no comfort as he spoke.